With work nearly complete, Mackley is entering the final phase of the Shoreham Adur Tidal Walls scheme. 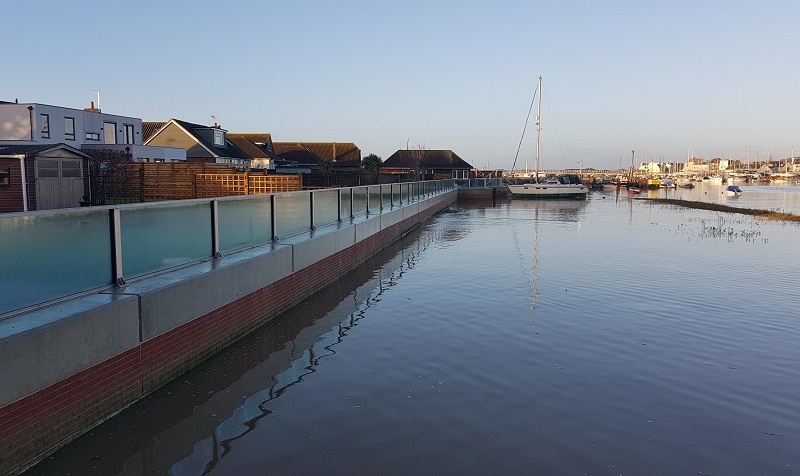 The Shoreham scheme is being carried out by Mackley, as part of Team Van Oord and on behalf of the Environment Agency, Coast to Capital Local Enterprise Partnership, Adur District Council and West Sussex County Council. Work on site commenced in October 2016, and when fully complete will significantly reduce flood risk to more than 2,300 properties in Shoreham and East Lancing – as well as protecting important local infrastructure including the road network, railway line and Shoreham Airport. This scheme was largely complete by the end of 2018, with Mackley returning to site in January and February 2019 to carry out the final works at W5 (Riverbank – houseboat reach) and W7 (Shoreham Airport). One of the already completed reaches is E3 (Downs Link) – which follows the route of a disused railway line – where Mackley has reinstated the old Downs Link path and cleaned the Heron statue, which was designed by pupils from Heron Dale School. When the statue was reinstated the pupils were invited to cut a ribbon to formally reopen it and learn more about the Downs Link and its heritage. Under the scheme, Mackley has also made improvements at W1 (Fort car park). Previously, the car park had no marked bays and a problem with littering and vandalism. The new improved car park includes marked disabled bays, a new community notice board, new benches and improved access to the beach – including a ramp that complies with the Access and Equality Act 2010. One of the highlights of the scheme has been the way Mackley has engaged with the local community, including the Shoreham Beavers and pupils from local schools. During November 2018, the project team hosted a series of workshops on flooding and flood defences, during which the Beavers were introduced to the equipment and materials used to build defences, before venturing out to see the defence at the Scout Hut. There have also been a number of school visits, with close to 400 pupils from eight local schools visiting during the two-year construction period. In summer 2018, the project team held six community walks, providing a unique opportunity for people to find out more about the work involved in the scheme. The walks were a great success, with Mackley receiving very positive feedback. One local resident said they were “most impressed by how hard and professionally your team has been working”, and “how impressive their work ethic is”.